The global mobile phone market is forecast to grow at just 1.4 percent year-over-year in 2012 -- that's the lowest annual growth rate in three years. Regardless, the total volume of shipped devices was significant. According to the latest market study by International Data Corporation (IDC), vendors will ship more than 1.7 billion mobile phones this year. In 2016, IDC forecasts 2.2 billion mobile phones will be shipped globally. Worldwide smartphone volume in the fourth quarter of 2012 (4Q12) is expected to reach 224.5 million units, that's representing a 39.5 percent year-over-year growth -- due primarily to strong consumer demand. For the year, smartphone shipments are forecast to grow 45.1 percent Y-o-Y to 717.5 million units. Strong smartphone growth is a result of a variety of factors, including steep device subsidies from mobile network service providers, especially in mature economic markets where carriers resell the majority of smartphones, as well as a growing array of sub-$250 smartphones in emerging markets. "Sluggish economic conditions worldwide have cast a pall over the mobile phone market this year," said Kevin Restivo, senior research analyst at IDC. "However, the fourth quarter will be relatively bright due in part to sales of high-profile smartphones, such as the iPhone 5 and Samsung’s Galaxy S3, in addition to lower-cost Android-powered smartphones shipped to China and other high-growth emerging markets." 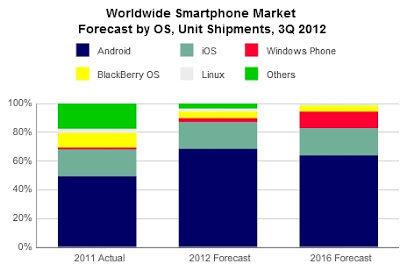 Underpinning the worldwide smartphone market is a constantly shifting mobile operating system (OS) landscape. Google Android is expected to continue its lead, but IDC also expects it to be the biggest target for competing operating systems to grab market share. IDC forecasts Google Android to be the clear leader, thanks in large part to a broad selection of devices from a wide range of partners. Samsung is the leading Android smartphone seller, though resurgent smartphone vendors LG Electronics and Sony -- both of which cracked the top five smartphone vendors during 3Q12 -- are not to be overlooked. IDC believes the net result of this will be continued double-digit growth throughout the forecast period. Apple iOS will maintain its position as the clear number two platform, behind Google Android at the end of 2012 and throughout the forecast. The popularity of the iPhone across multiple markets will drive steady replacements and additional carrier partners will help Apple grow iOS volume. However, the high price point of the iPhone relative to other smartphones will make it cost prohibitive for some users within many emerging markets. In order to maintain current growth rates, Apple will need to offer less expensive models, similar to its iPod line. Until that happens, IDC forecasts iOS to ship lower volumes than Android. The RIM BlackBerry OS will grow slowly but largely maintain share over the coming years following the BlackBerry 10 launch next year. IDC says that the new operating system and devices will be valued by some longtime BlackBerry fans, particularly those who have waited for the new OS as Research In Motion delayed its release. IDC believes that Microsoft Windows Phone will battle with BlackBerry for the number three spot in 2013, but will gain further clarity in the years that follow. Windows Phone will build on the progress it made in 2012, with Nokia establishing its presence and HTC solidly jumping back into the race. Linux will trail the market leaders throughout this forecast, though it's subject to change . K-Touch has quietly built its Linux volumes this year while Haier recently released its first Linux smartphones. In addition, multiple platforms are expected to announce and launch their Linux-based smartphones in 2013 -- including Samsung's Tizen and Jolla's SailFish.